Presentation and Selling Skills.The most powerful way to close a insurance sale. Learn how the relationship building concept can increase your life insurance sales. The presentation and selling skills of all insurance agents is something that continues to be refined through concept selling and painting word pictures. And finally policy delivery (sitting down with the client and re-confirming why product solution address client’s objectives) which I feel is about 15% of a producers overall success in this business. Most producers are fairly competent in this presentation and selling skills set – although after observing and personally conducting in the area of several thousand sales interviews, plenty of room for improvement exists in our industry (myself included). especially n the areas of concept selling and painting word pictures. The key phase of the sales interview I have seen most often short changed, is the fact-gathering phase. This is where the true “close” in selling life insurance takes place. Show me a fully completed fact-finder, and a quality sale more often than not took place. Surprisingly, quite often the veteran sales person tends to short change this phase frequently. Having seen “this situation many times before”, veteran sales people ‘in error’ often jump to the solution for the client’s life insurance problem. Although often the protection need is quite apparent to the producer, its not so apparent to the layperson who’s patiently listening and silently wondering “why is this sales person recommending the purchase of this particular policy … I don’t see the connection to what I need” ... “besides, this sales person doesn’t know me all that well (partially completed fact-finder), so it seems to me that he/she is just trying to sell me an insurance policy”. Your presentation and selling skills need to be refined through properly listening and fact finding. The diagram below illustrates the two diverse sales processes. The triangle represents the amount of time – same amount for two diverse sales approaches – spent on a sales interview with a prospect. 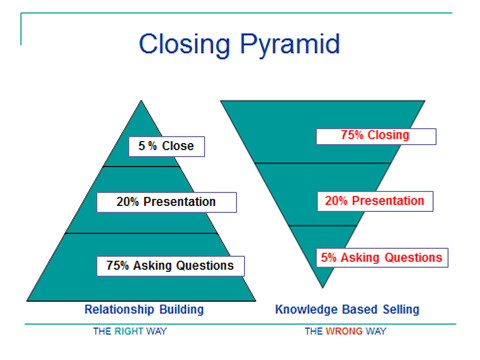 The ‘transnational’ sales person - illustrated on the left in the above pyramid - short changes the sales interview during the fact-finding phase. Consequently, the amount of time needed in the “closing” phase is a great deal more complicated and time consuming than the ‘relationship-based’ sales person. Typically these are sales people who attempt to gain clients through “convincing” the consumer how good their company’s product is – usually through a detailed and time-consuming review of a computer generated product illustration. The relationship-based sales financial professional is illustrated on the right in the above pyramid. This sales professional spends sufficient time in the fact-finding phase by getting to know the client’s dreams, goals, and desires – along with the financial position of the client. This style sales process will almost always lead to a higher closing ratio, better persistency, an easier time closing the sale, and will always result in quality referrals, as well as being able to develop and get repeat or multiple product sales with the client. Learn how to use the most powerful tool to make this proven relationship-based sales concept work. it will help you make more money selling insurance and help solve your closing problems. this article on presentation and selling skills probably needs to be reviewed by you at least several times, and you should write down key points that may help. The Quality Fact-Finding Agent Uncovers and Creates The Need by properly asking probing questions. the "relationship based financial professional" - helps customers buy. The “transnational” sales person - sells product and company. As an agent evolves in the life insurance business, they will learn that the "relationship based financial professional" closing technique is the most effective insurance selling skill to use. Get your Mastering the Art of Closing a Sale e-book today. It is a complete and organized format of the many articles on our site, plus much more. It is a great new agent training tool. Agency managers are using this to help train new agents.